What kit do we need to turn a kayak into a fishing kayak? This write up is a continuation of my last article which included some pieces of kit you need to enjoy and have a successful trip. 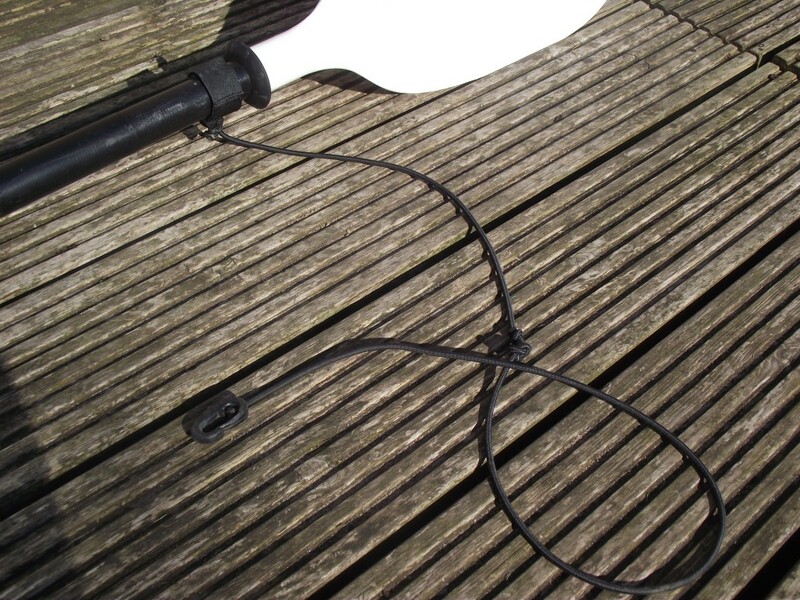 With the exception of the paddle which is a necessity, the bits of kit we will talk about in this article are all aimed at making our lives easier and more enjoyable whilst fishing. 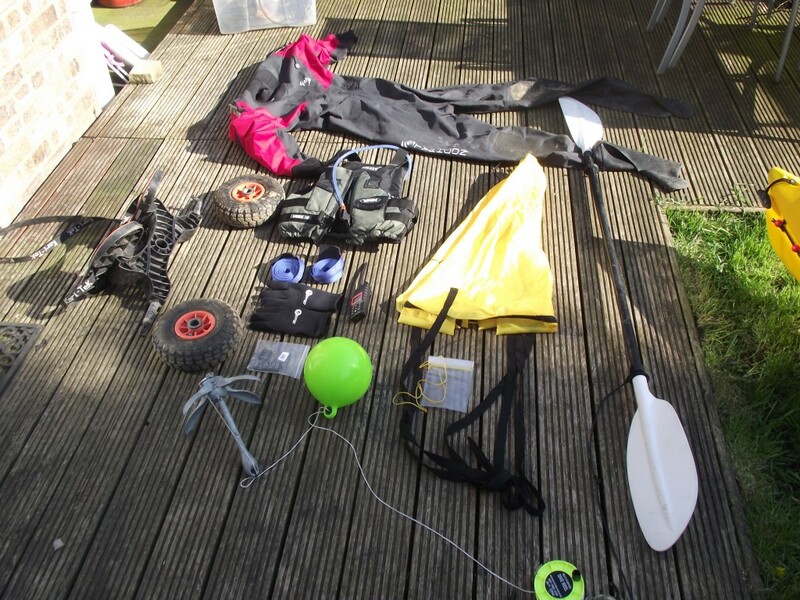 Lets start with the paddle, after the kayak itself it is the most important piece of kit, no paddle, no trip simple unless you have arms like frogs legs then please buy a paddle. There are different lengths and types of paddle, and for such a simple bit of kit there are loads of different options. When you buy your kayak I would advise to buy the paddle as you are purchasing your kayak. I would buy from the shop and sit in the kayak and try holding different size paddles. Hopefully the person selling the kayak knows what they are talking about, and they can advise you on which one to get. The next item on my list is the Ctug. 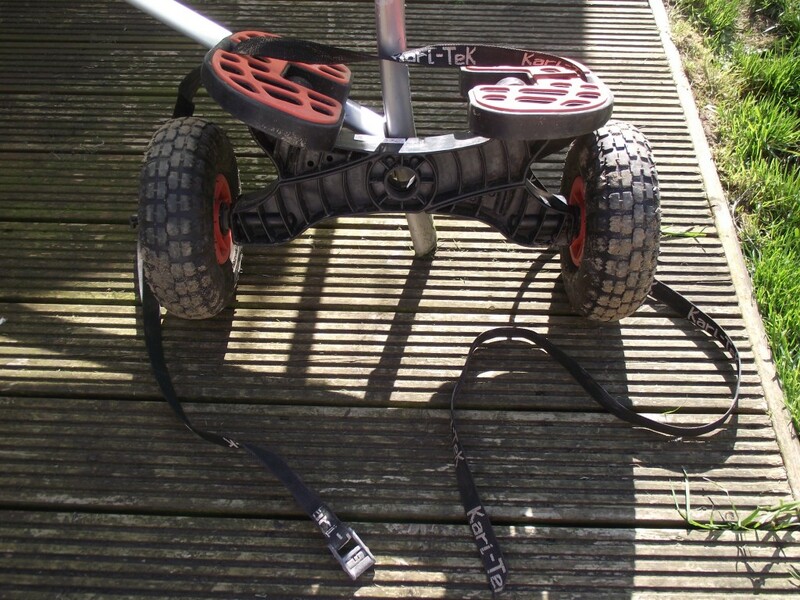 It is a very good bit of kit which makes your trip a lot easier when launching your kayak for the days fishing, the Ctug is a set of wheels with a strap so you can tighten around the kayak to make sure it’s got a secure fit. You can get hard plastic wheels or rubber blow up wheels but although you have the blow up ones because they were a bargain at the time of purchase, I would highly advice getting the plastic ones as they are 100% not going to deflate. If you try to carry or drag your kayak without these wheels will result in damage to the bottom of your kayak from dragging or you’ll need to be pretty strong to lift and carry your kayak plus all the water that normally gets into it. Next I would like to talk a bit about the gloves. Although not essential I’d advise getting a pair of these, as you’ll not get blisters or sore red hands from paddling out. They are also great for winter as you’ll keep your hands dry and warm to some degree especially if you live where I live near the North Sea “ouch”. 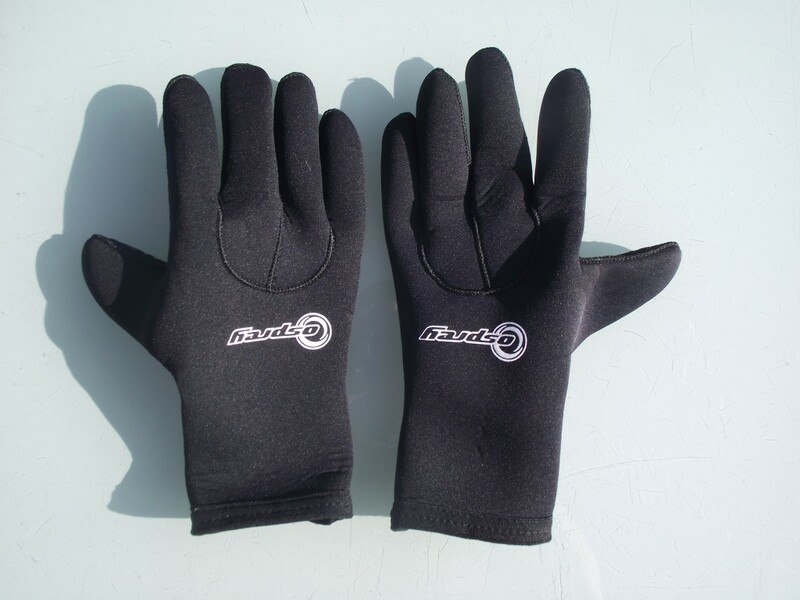 If you are paddling in warmer areas or during the summer then you can get fingerless gloves which still give you plenty of protection. The next piece of kit is very important in my own opinion, as it may be your last resort “not trying to be too dramatic” but it’s the waterproof phone cover for mobile phones. Your radio battery may run out, or you may have lost your flares or other pieces in the surf. it’s always good to use it so you can go out and take pics of the scenery if you wish or you may want to take important phone calls these are cheap I got mine for a fiver from eBay so not that much of a hole in your pocket. Well well leashes! As I experienced before not leashing your kit can be costly if you fall off your kayak or get tipped from surface swell or inshore waves It’s safe to say now that I’ve got over it, I lost a £350 reel and yes it was my dad’s “nightmare”. So basically yes before you go out leash all your kit and equipment, well at least the things you wish to keep especially the fish!. 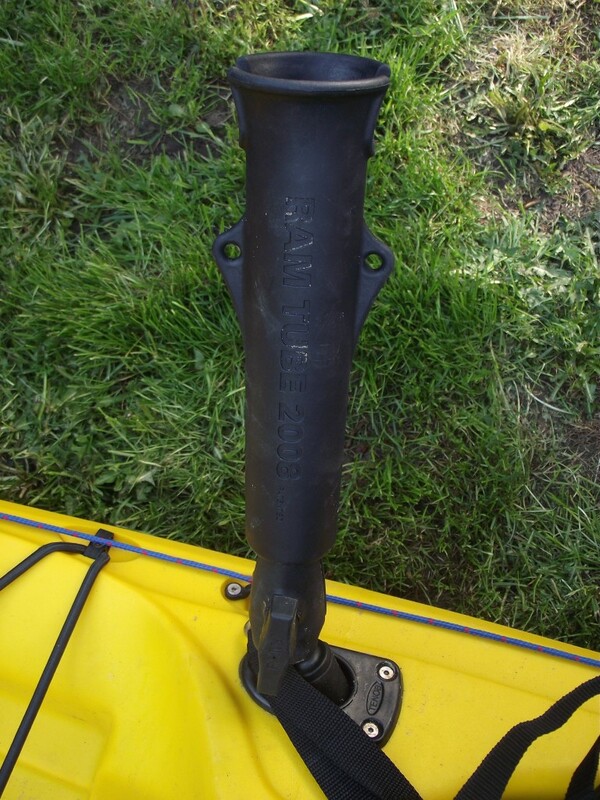 Another luxury/extra for the kayak is the ram rod tube the adapter at the bottom on mine never leaves the inside of the hole in the kayak I’ve fitted it so tight it doesn’t move so when I go out all I have to do is twist tighten the tube to the adapter and this is used so when your bait fishing you can turn the rod holder forward so you can sit back relax and drink eat and do whatever like I do and watch for the bite on the tip very handy bit of kit and well worth the money. The drogue is a good piece of kit but I hardly use mine because paddling back over the good ground you just drifted past you have to keep on pulling it back in and deploying over and over again, so yeah I drift paddle, drift paddle and drift and paddle that’s just the way I role when drifting and jigging for cod and Pollock etc. 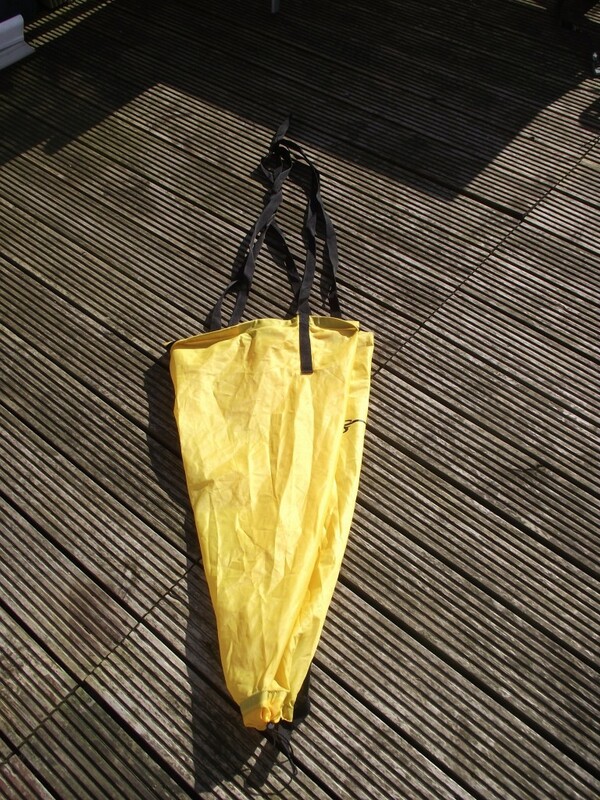 A drogue slows your drift down when the water is going one way and the wind is going the other, it may not be right on the day so you may not even have to use it most of the time they are fairly cheap, I opted for the large one. The anchor however is very good if you want to bait fish please practice using an anchor, as you don’t want to deploy it and have the current pulling you off the kayak. 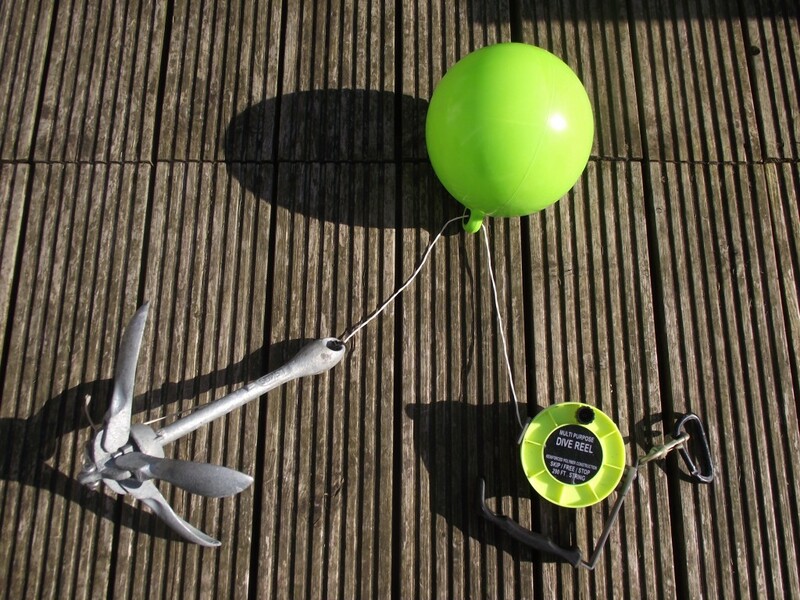 I also have an anchor trolley as I explained in the other article, with an anchor make sure you have a good anchor trolley a decent divers reel and a small buoy and the obvious one the anchor as you’ll see on the attached pictures when you deploy the anchor when the anchor touched bottom mover the trolley either rear or front your choice as long as it’s not in the middle you should be ok if done properly I would advise that you don’t anchor on extremely rough rocky ground, well you can if your prepared to snip the line and leave with no anchor. We will cover all the components and how to fit an anchor trolley in a future article. The final piece of equipment I like is a camera. I have a GoPro hero3 in white these are costly but worth the money if you want to make your own videos of your trips which is cool because hey hoo, who doesn’t want a video of you catching that monster! If you are on a tight budget there are various cameras to choose from but get some advice on good picture quality before buying because you don’t want a video and poor quality stay safe guys and enjoy. 2 Responses to "Kitting out your kayak for fishing"
I think you need some decking protector! Come talk to me at Weymouth for a deal.